Santa Baby – Let’s start with a fun one! It’s time to bust out the Christmas lights and the plastic Santa (if you are so inclined)! While you’re up on the roof making sure Blitzen is positioned correctly, do a spot check for any loose or missing shingles. 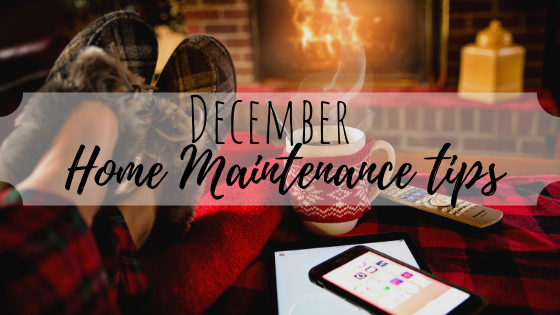 It’s also a great time to check all your exterior electrical components—from exterior lights to plugs, just to make sure nothing seems wonky. Pipe Wrapping – Disconnect all your garden hoses and wrap all exterior pipes and spigots. Also, if you don’t have central heat, you may want to consider wrapping interior pipes or at the very least, keeping the cabinet doors open—especially those plumbing fixtures mounted on exterior walls. Busted pipes are not very festive. Vent Check – Dryer vents need to be cleaned. If you can’t remember the last time you cleaned it out or if you suspect it may be time, just do it. It’s a big fire risk and an easy fix. Draft Eliminator – Cold drafts coming into your house can mean some annoyingly cold nights and can higher energy bills. Seal all openings with caulk or with weather-stripping. Santa Proofing – Make sure you aren’t harboring fugitive birds or creosote buildup in your chimney—Santa’s dry-cleaning bill is too high already! Before you light that first fire of the winter, be sure to check your chimney (or better yet, have it professionally cleaned) for buildup. Chimney fires are completely preventable, so clean it to be safe! #CleanFilter—The perfect finish to a short list because this is a 1-minute fix! Change your air filter. It will help your system run more efficiently and cut down on allergens. Don’t forget to enjoy the season with warm nights cuddled around the (freshly swept) fireplace with dear friends and family. Happy Holidays! Lisa Priest can’t wait to put up her Christmas tree and is an East Texas Area Broker/REALTOR® with Picket Fence Realty, Inc. You can reach her at 903-948-3343 or read more at BuyPalestine.com.